See the coverage maps for more details of the area covered. Both the northern and southern areas were chosen to coincide approximately with the area covered by the Sloan Digital Sky Survey. Over most of the survey area, the detection limit is 1 mJy. A region along the equatorial strip (RA = 21.3 to 3.3 hrs, Dec = -1 to 1 deg) has a deeper detection threshold because two epochs of observation were combined. The typical detection threshold in this region is 0.75 mJy. There are approximately 4,500 sources below the 1 mJy threshold used for all previous versions of the catalog. The catalog is on-line and can be searched using the FIRST Search Engine. However, for large-scale investigations it will be necessary to obtain the complete catalog. This document describes the catalog format. Note that this format differs from that in previous versions of the catalog. The P(S) column, which indicates the probability that the source is a sidelobe, replaces the previous binary sidelobe flag column. The columns following the field name give information on counterparts to the FIRST source in the SDSS DR8 catalog and the 2MASS catalog. These new parameters are described in detail below in the description of the P(S) column and the counterparts columns. Names for FIRST sources are derived from the positions according to IAU recommendations. (The positional uncertainty is of course elliptical for elliptical sources.) The best possible positional uncertainty is limited to about 0.1 arcsec by our ability to fit source positions in maps with 1.8 arcsec pixels and by various random calibration uncertainties. Systematic errors in the positions are smaller than 0.05 arcsec. Sidelobe probabilities for this version of the catalog have been computed using an improved algorithm based on multiple voting oblique decision tree classifiers. The classifiers were trained using deep VLA fields that give reliable assessments of the reality of FIRST sources. The algorithm will be described in detail in a future paper on the final FIRST catalog; we believe it is a substantial improvement over the previous sidelobe flagging approach. Nevertheless, we still recommend checking the images using the FIRST Cutout Server if there is doubt about the reality of particular sources. This is easily done when using the FIRST Search Engine to search the catalog, since each source selected in the search has a link to the Cutout Server. The uncertainty in Fpeak is given by the rms noise at the source position, while the uncertainty in Fint can be considerably greater depending on the source size and morphology. For bright sources the accuracies of Fpeak and Fint are limited to about 5% by systematic effects. Note that for sources that are not well-described by an elliptical Gaussian model, Fint is not an accurate measure of the integrated flux density. Rms is a local noise estimate at the source position measured in mJy. Rms is computed by combining the measured noise from all grid pointing images contributing to this coadded map position. Note that the signficance of detection for a source is (Fpeak-0.25)/Rms, not Fpeak/Rms, because of the CLEAN bias correction to the peak flux density. The catalog includes only sources brighter than 5 Rms. The coverage in the southern Galactic cap is ragged (and discontiguous) at the northern edge because poor weather and equipment failures prevented the planned survey area from being filled in there. Maj, Min, and PA give the major and minor axes (FWHM in arcsec) and position angle (degrees east of north) derived from the elliptical Gaussian model for the source. Maj and Min have been deconvolved to remove blurring by the elliptical Gaussian point-spread function. (The fitted parameters before deconvolution are given in the fMaj, fMin, and fPA columns.) In the north the beam is circular 5.4 arcsec FWHM; south of declination +4°33'21", the beam is elliptical, 6.4x5.4 arcsec FWHM, with the major axis running north-south. In the southern Galactic cap (RA = 21hrs to 3hrs), the elliptical beam size increases further to 6.8x5.4 arcsec south of declination -2°30'25". Noise can cause the fitted values of the major and minor axes (before deconvolution) to be smaller than the beam. The corresponding deconvolved size is given as zero in that case. where SNR is the signal-to-noise ratio defined above. fMaj, fMin, and fPA give the major and minor axes (FWHM in arcsec) and position angle (degrees east of north) derived from the elliptical Gaussian model for the source. These are the fitted sizes measured directly from the image; the elliptical point-spread function has not been deconvolved. The Field Name is the name of the coadded image containing the source. Note that the field name encodes the position of the field center: field hhmmm+ddmmm is centered at RA=hh mm.m, Dec=+dd mm.m. The images are available from several archives and through the FIRST Cutout Server. All field names in the current catalog end with a letter E through S, depending on the date of the last catalog release in which the image was modified. The Q, R and S fields are new in this catalog, while sources extracted from the E-N fields are essentially identical to those in the previous version of the catalog. 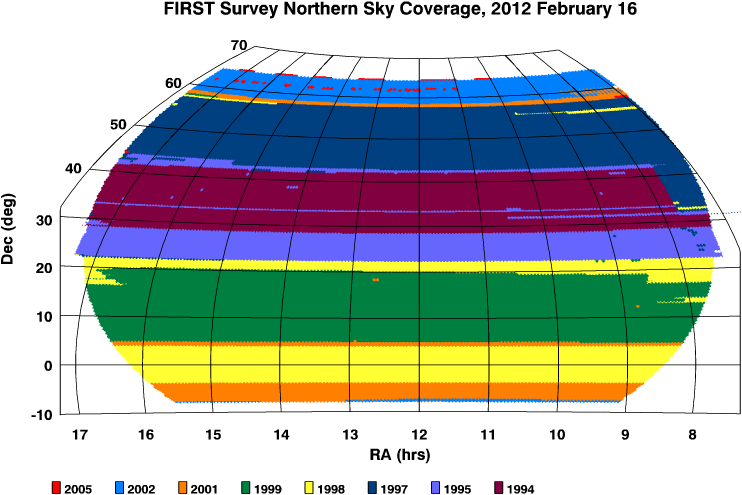 The Q fields include contributions from data taken in Spring 2009; the R fields include remade grid images that were found to have instrument or processing problems; and the S fields include data taken in Spring 2011. The remaining 7 columns give information on optical counterparts from the DR8 release of the Sloan Digital Sky Survey and infrared counterparts from the 2MASS catalog. The SDSS and 2MASS matches were performed using the SDSS-III CasJobs web interface. For each catalog there is a column giving the number of matches within a fiducial radius of 8 arcsec and, for the nearest match, the separation from the FIRST position in arcsec and the magnitude. For SDSS the morphological classification is also given (s=stellar, g=nonstellar/galaxy). A count of zero indicates there are no sources within this radius (which is also indicated by a separation of 99.00 and a classification of '-'). For SDSS, a count of -1 indicates that the FIRST source falls outside the SDSS DR8 survey area so that no SDSS data are available. All of these catalogs have multiple wavebands available; the given magnitudes are for i (SDSS) and K (2MASS). For SDSS, a magnitude of -1 indicates that the magnitude in the DR8 catalog was given as -9999. Note that these new parameters can be used for catalog searches via the "Additional Constraints" field in the FIRST Search Engine web form. See the Additional Constraints Help Page for more information. The catalog history page describes previously released versions of the FIRST catalogs, which are still available for historical purposes. We recommend that the new catalog be used where possible for all projects.